A row has broken out in the Indian capital over whether Delhi university should teach a controversial essay about the Hindu epic, the Ramayana. The essay by the well-known scholar AK Ramanujan was dropped from the history syllabus earlier this week after protests from Hindu hardline groups. The article describes 300 different retellings of the epic story found in India and other Asian countries. Protesters say the versions recounted in the essay offend Hindu beliefs. Entitled "Three Hundred Ramayanas: Five Examples and Three Thoughts on Translation", the essay has been part of the university's history course since 2006. Hindu groups have protested against its inclusion since 2008. Following an order from the Supreme Court, an expert committee was formed to look into the issue. Last week, three of the four committee members recommended that the essay should remain part of the syllabus. Nevertheless, the university's academic council [which decides the syllabus] voted to drop the essay from the syllabus earlier this week. "We find it very unfortunate that a course that was included and passed by the history department... has been dropped," Mail Today newspaper quoted Professor Sunil Kumar as saying. "The department has prepared a letter informing the council about its position and also asked the council to reconsider its decision," he added. Critics of the essay argue that it refers to versions of the Ramayana which claim that Lord Ram and Sita were siblings and that the 10-headed demon king Ravana was Sita's father. In the most popular version of Ramayana, written by the Hindu sage Valmiki, Ram and Sita were married and are held up as an ideal couple. 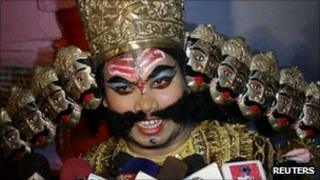 Ravana, it says, desired Sita for himself, kidnapped her and held her hostage until Ram rescued her. Effigies of Ravana are burned across India during the annual Dussehra festival.